A magyar változathoz kattints ide! Off-White stuffs and sneaker collabs by Virgil Abloh have stolen the show last and this year too. The biggest hit were ten reconstructed (or better deconstructed) Nike silhouettes: The Ten collection. 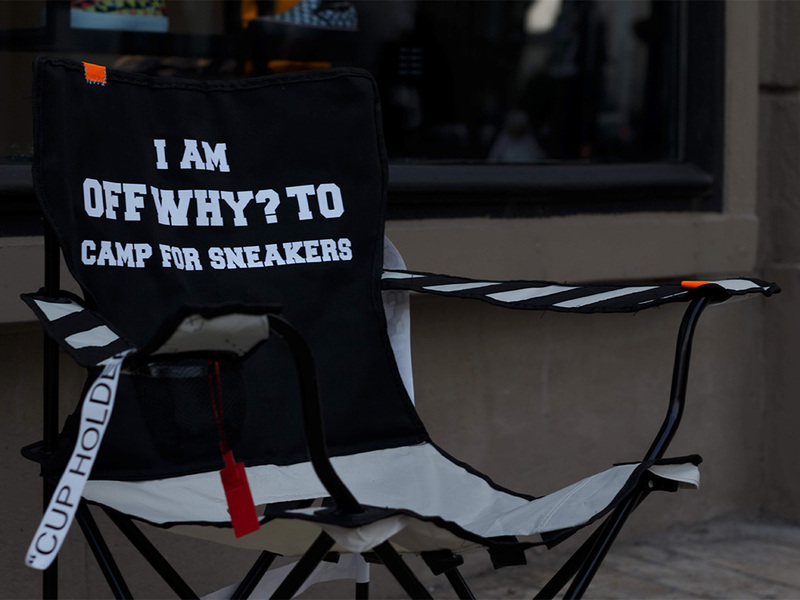 That’s why the camping chair – the main part of our Sneaker Camping Kit – has been reworked following the style guide of master Abloh. First of all the chair has been “deconstructed”. The seat has been cut out then the typical Off-White stripes have been placed there. These stripes come back on the arms too. For those who tend to forget what are the parts of a chair some useful hints have been left behind: all parts have been “LABELLED” as on the Off-White sneakers. Of course there are the orange and blue badges and sewings too… and the zip tie. Last but not least the big label on the chair back doesn’t leave any doubt what this camping chair is intended for. Dehydration is real threat during sneaker camping too. Unfortunately hype content of bottled mineral waters are extremely low. 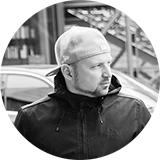 But there is a solution: past years proved that any object labelled with a Supreme box logo resulted in intense increase of hype. 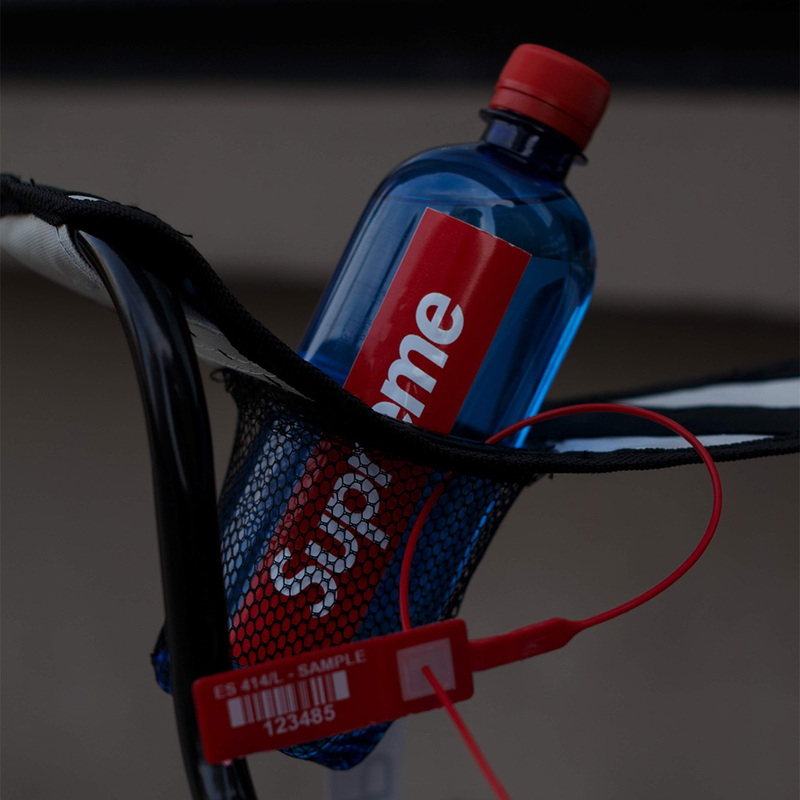 Results from various experiments clearly showed that supremefication upgraded ordinary water to hypewater: hype content and price have been tenfolded! So, drinking Supreme water when camping can balance hype content of your body all the way. And don’t forget to resell the empty bottle: WTS/WTT 1/10 one size Supreme bottle (not DS). Supreme water – dehydration is a real threat during camping too! If you camp for some heat sneakers things can easily escalate and there will be too much heat at once! In this case you need immediate help to restore the right temperature. So it’s high time to switch on your BRED colourway handheld ventilator to cool down yourself. This cw was a great success for Michael Jordan and Nike, so you can’t be wrong with it. What’s more: batteries ARE included! 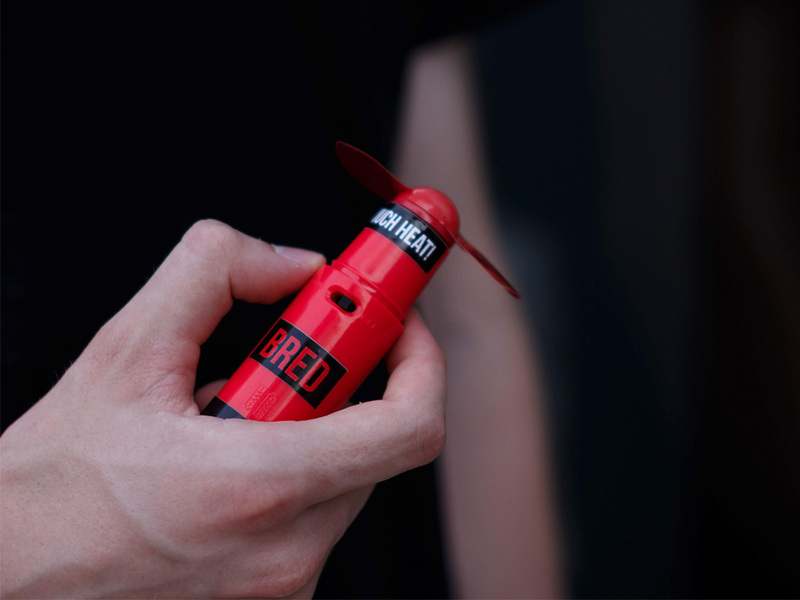 BRED handheld ventilator – if there is too much heat! If you don’t camp overnight it’s not even sneaker camping just queueing 😉 But even when the weather is fine temperature may drop after sunset, thus a soft and stylish blanket is a must-have in the Sneaker Camping Kit. For chilly nights and cool dawns this Black/White/Zebra colourway blanket will be your best friend. Its pattern was inspired by one of the most hyped sneaker silhouette of Kanye West – we are talking about the Yeezy Boost 350 v2 ‘Zebra’ cw of course. Wrap this blanket around you from 3.50 am to 7.50 and let the love of Saint Pablo flood your body. 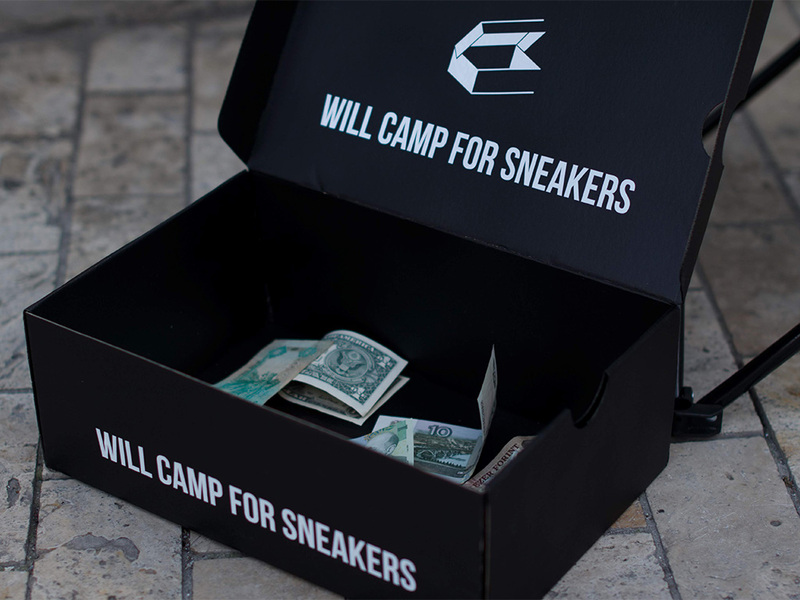 Last but not least our Sneaker Camping Kit contains an OG sneakerbox.hu shoebox. You can store some of the items of the camping kit inside, moreover it’s good to raise money for the purchase of your new pair of sneakers – but don’t belive so strongly in the openhandedness of people for such purpose. 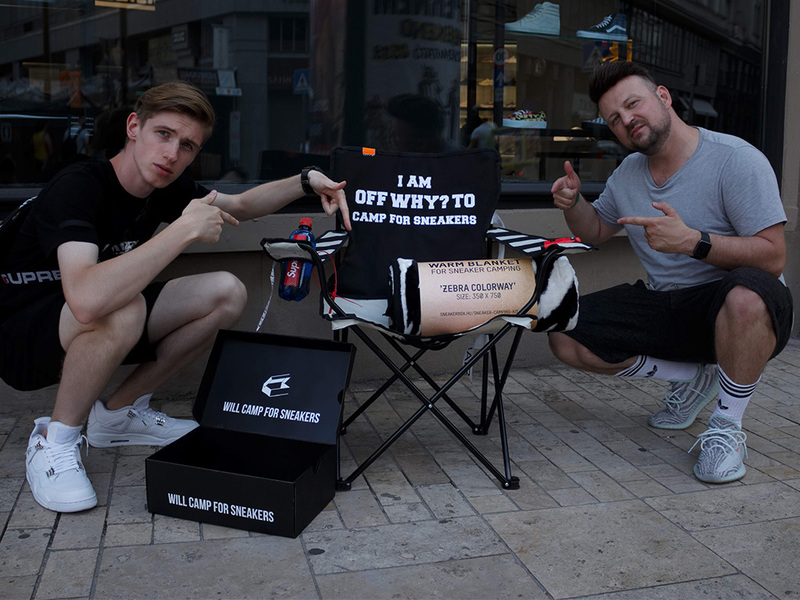 The creation of the Sneaker Camping Kit has been a real teamwork, big thanx to Dávid and Adrián for the contribution, and of course to Jaki for the photos and the video! 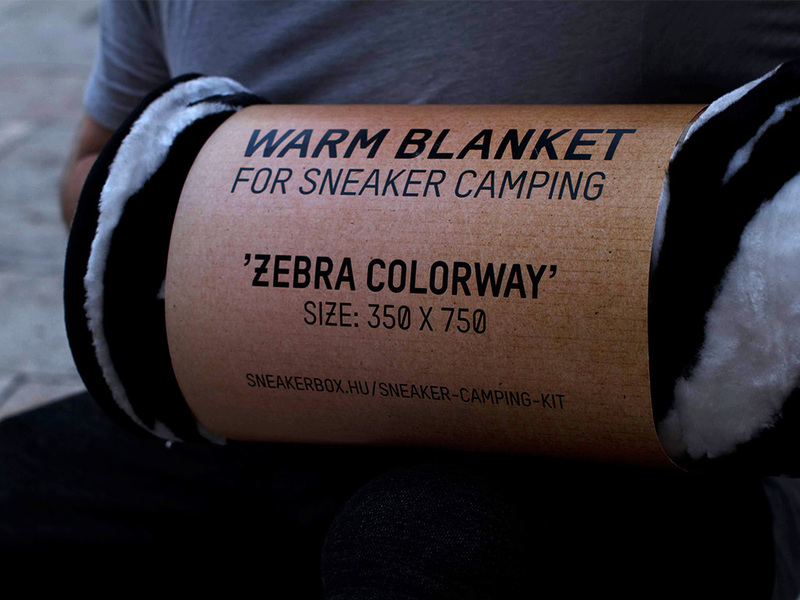 If you like the sneaker camping kit show some love by giving a thumb up or sharing this stuff. Follow us on Instagram, subscribe on YouTube! Thanks!